Continuing the discussion of the importance of Symbolism in Chinese Internal Martial Arts, Part 3 delves into Yi Jing (I-Ching) symbolism which pervades all of Chinese thought and culture, including the internal martial arts. The study of the Changes, or Yi Xue, is a black hole within the China field, a dense and immense space that allows no possibility of escape for anyone drawn by its immense pull. Still, by almost any standard, the Classic of Changes is one of the most important documents not only in Chinese history, but arguably in world history as well. That being understood, we will attempt to scratch the surface of Yi Jing thought and symbolism in relationship to the nei jia. 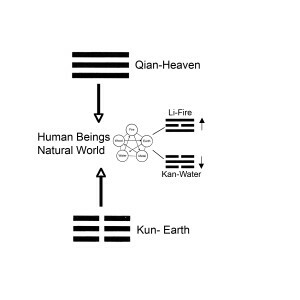 Earlier, in Part 1 of this discussion, we saw that Heaven is represented by the Qian Diagram, and Earth by the Kun Diagram. Heaven’s three strong yang (unbroken) lines push downward. Earth’s three “weak,” receptive yin (broken) lines receive Heaven’s energy and respond by rising upward. In between these two forces are human beings and the natural world in which we live, represented by the Five Elements, or five forces. For human beings and their life on earth (post-heaven existence), Li-Fire and Kan-Water are the dominant forces. 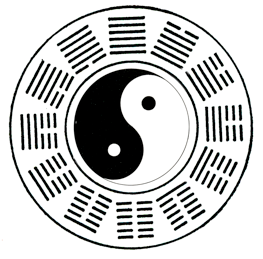 Li-Fire is representative of Heaven’s yang principle, and Kan-Water representative of Earth’s yin. All internal martial arts employ the Wu Ji posture as a starting point. 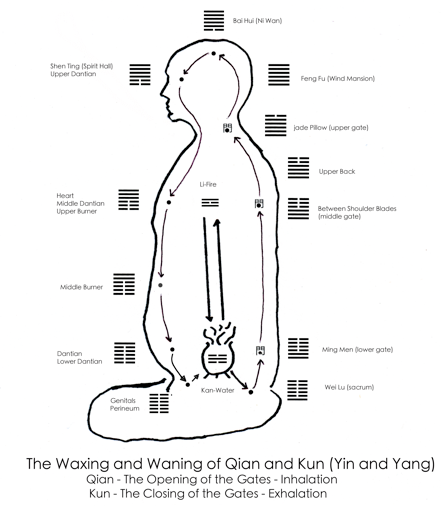 In Wu Ji, the practitioner feels the energies of heaven and earth connect through the central channel. Within this place of stillness, one feels fire and water connecting and inter-transforming. Li-Fire is associated with the heart and chest and Kan-Water is associated with the Kidneys and the Dantian. 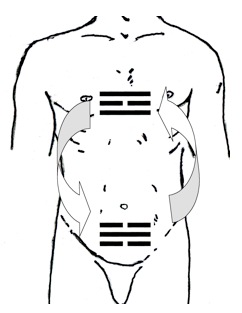 Kan has a solid yang line in the middle, so the lower abdomen (Dantian) is said to be “full” (of qi, breath, force) relative to the chest. Li has a broken line in the middle, so the chest is thought to be “empty” relative to the Dantian. This is to some degree a function of “Kidney Breathing,” the deep abdominal breathing that is essential to the practice of Nei Gong and internal martial arts. When the heart and chest are relatively empty, the spirit is calm and stable. When the lower abdomen is full, qi is stored and jing is replenished. When the spirit is calm and stable and the lower abdomen is full, there is stillness inside, even as Kan and Li connect and inter-transform. There is stillness even as the body moves and changes. This is an essential part of the of internal martial arts. It is employed not only in generating power and keeping the mind calm during combat, but also in the nourishing life (yang sheng) aspect of these arts. In Xing Yi Quan, when we stand in the Three Body Posture (San Ti Shi), we connect with the energies of Heaven and Earth through the head and feet, and through the posture we allow Fire and Water to connect, circulate and inter-transform. Normally Water and Fire have a tendency to separate: Water flows downward toward Earth and Fire burns upward, rising toward Heaven. Through the Nei Gong practices in the internal arts (and in Daoist internal alchemy), Water and Fire are induced to switch positions. Now, rather than moving away from each other (fire upward and water downward, as described above), Water and Fire move towards each other and interact correctly. The solid center central line in water is called the “hidden fire” within water. This also represents the Mingmen fire – the “life gate fire” or long lei zhi huo, “dragon thunder fire”. People do not know that Fire in the midst of water is none other than the First True Qi of Heaven stored in the midst of Kan. The life-giving qi of Mingmen is the eternal movement of the Original yang symbolized by the trigram Qian, The Creative, Heaven. Similarly, the broken line inside Li is the “hidden water” within Fire. Fire and Water each carry within themselves the seed of the other. By circulating Fire and Water so that they intermix, Fire is brought below Water, starting a alchemical process of change and transformation. One of the purposes of Nei Gong practices in the internal martial arts is to stimulate this transformative process, which is often likened to refining and forging steel. If Fire moves beneath Water, it creates steam and condensation, which is a rarefied energy. This process can be likened to water heated on stove, creating a vapor which rises upward only to coalesce and descend again. The two elements must act in relation, in balance, to each other. If the heat is too great, the water will all evaporate, if the water boils over the fire will be extinguished. This balance is represented by the hexagram #63: Ji Ji (Completion) in which the trigram for Water is above and the trigram for Fire below. Here, water and fire interact and inter-transform. By employing proper posture, breathing and stillness of the mind, the Dantian is like a stove that heats water, so that the water transforms into vapor which rises up to the chest and heart, where it coalesces to become water, and then sinks back to the Dantian. Metaphorically, this plucks the yang-solid line from the center of Kan-water to fill the yin-broken line in the center of Li-Fire, thereby producing Qian-Heaven, represented by three solid-yang lines. The yin-broken line in the center of Li-fire then moves to the center of Kan-Water, thereby producing Kun-Earth, represented by three broken-yin lines. 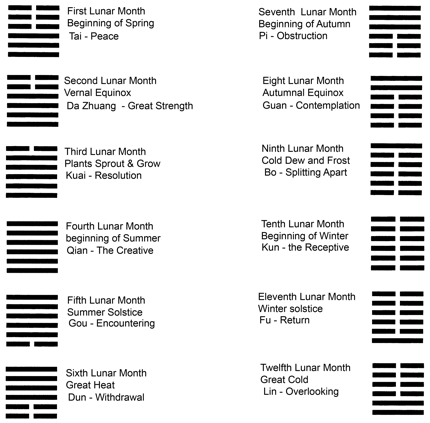 When the middle lines of the trigrams switch places and form the Qian-Heaven and Kun-Earth trigrams, there is a return to the original pre-heaven (before-birth) state, which in Daoist beliefs leads to stopping of the temporal movement and therefore “immortality,” or more practically speaking, a reconnection of our conscious mind with our innate wisdom, resulting in a deeper connection with the world. In the martial arts, this transformation allows the practitioner to connect with his or her natural, instinctive, movements and reactions. This is represented by the balanced and harmonious hexagram that results from this transmutation of water and fire: Hexagram #11: Peace (Tai). For another example of the connection of Yi Jing symbolism with the nei jia we can look at the trigrams Gen-Mountain and Zhen-Thunder. Zhen (震) means to shake or quake like an earthquake or thunderclap. It represents sudden movement, that is arousing and stimulating. Zhen is the incitement of movement, the beginning of a new action. Zhen is composed of a single yang line under two yin lines. The broken lines create an open path for the moving yang line to move forward and upward without obstruction. The Twelve Hexagrams assume great importance in understanding the movement of energy in the central channel of the body, both in meditation and the practice of martial Nei Gong – San Ti Shi in Xing Yi, Wu Ji and the opening of the Tai Ji Form, and Ding Shi in Ba Gua Zhang. These twelve hexagrams are sometimes called The Waxing and Waning Hexagrams, the Tidal Hexagrams or the Twelve Sovereign Hexagrams. They are often used to describe the waxing and waning of yin and yang over the 12 months of the year. The Hexagram Tai (Peace), represents a balanced situation with yin and yang in harmony. In Tai, Earth is above Heaven. This Hexagram is associated with the first month on the Chinese calendar. The sap begins to rise, life is stirring and animals are ending their Winter hibernation. It is also the time for the life-nourishing spring rains to begin. Tai is associated with the Tiger – power and strength balanced by wisdom and pliability. The ideogram shows the upper part to be a fusion of 大 and 廾 two hands. The lower part of the ideogram is 水 water; the word is etymologically the same as 太 (tài), and as 大. [wenin] The Tiger and Tai (泰) are associated with the Lungs and Lung meridian which is part of Taiyin (太阴). Taiyin originally signified a layer of clouds swollen with rain. Taiyin, from this perspective, denotes clouds in the sky, or water in the sky that is about to fall. This in turn relates to the lung function of disseminating moisture and qi downward throughout the body. In Nei Gong exercises and martial arts, the Tiger’s relationship to this movement is seen in its pouncing action which pushes the qi forcefully outward and downward through the body. In the Five Animal Play, a series of internal exercises created by the great physician Hua Tuo at the end the Eastern Han dynasty (AD 25-220), the Tiger movements are said to dredge the meridians and aid the descending and disseminating action of the lungs. The Hexagram Guai is associated with the Dragon and the final season of Spring. Yang qi is rising upward to peak in the summer. Nature is transforming and plants are entering the mature stage in which they get ready to offer fruit, while spring blossoms fall to the ground. Lake over Heaven symbolizes that water has risen high and now there will be a breakthrough or transformation. The dragon and Guai are also associated with the Stomach meridian which is part of Yangming. They are also associated with Qingming (clear brightness). In Sun Lu Tang’s Ba Gua, the Dragon posture with arms upraised to Heaven is said to open the Yangming channels. In the deer frolics of the Five Animal play, the deer replaces the Dragon as the emblematic animal of the East and its movements benefit the tendons and liver, both associated with the Green Dragon of the East. Hopefully these examples adequately illustrate the pervasiveness and importance of symbolism in Chinese thinking, language and culture. The old masters and those of the present generation of masters all came of age with these symbols embedded in their consciousness. As Westerners studying Chinese martial arts, we have to extend ourselves to understand and incorporate these images into our own thinking processes and training. In the same way that the “300 Spartans” conjures up a whole series of images, historical connotations and interrelationships for a Westerner, Zhang Fei Steals a Horse (a Ba Gua movement that references a character from the Romance of the Three Kingdoms) creates a wealth of associations for a Chinese person that influence the way they think, feel and practice. Fathoming the Cosmos and Ordering the World: The Yijing and its Evolution in China, by Richard J. Smith. University of Virginia Press, 2008, p. xi. Nei Gong: The Authentic Classic – A Translation of the Nei Gong Zhen Chuan, translated by Tom Bisio, Huang Guo-Qi and Joshua Paynter. Outskirts Press Inc, 2011, pp. 53-57. The Complete System of Self Healing: Internal Exercise, by Dr. Stephen T. Chang. San Francisco: Tao Publishing 1986, p. 200. The 12 Chinese Animals by Zhonxian Wu. London and Philadelphia: Singing Dragon 2010 p. 98.